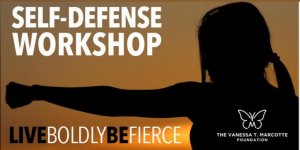 Join us for a Women’s-Only Self-Defense Workshop. Pre-registration is required and space is limited, so sign up today! During this active participatory workshop, you will practice realistic self-defense tactics. You will also learn situational awareness and how to handle a confrontation both verbally and mentally. Prepare to challenge yourself and feel empowered! All participants must be 18+ and sign a waiver. Pre-registration is required and space is limited, so sign up today! All participants must be 18+ and sign a waiver. Registration is at 5:45 p.m. • Program begins promptly at 6:00 p.m. The registration fee is $15 per person and attendees will receive a complimentary t-shirt. Since this is a popular event and space is limited, we ask that you only register if you are certain you can attend. Thank you!